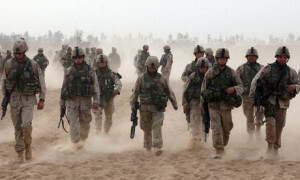 Fallujah falls to al Qaeda: Did American soldiers die in vain? (by Doug Ernst) – Fallujah. To anyone who closely followed the Iraq War, the name speaks volumes. No matter where you stand on U.S. foreign policy in a post 9/11 world, Fallujah holds all the stories you will ever need to make your case and defend the position. Now that the city has fallen into the hands of al Qaeda, the story becomes much sadder than it ever needed to be. BEIRUT – A rejuvenated al-Qaeda-affiliated force asserted control over the western Iraqi city of Fallujah on Friday, raising its flag over government buildings and declaring an Islamic state in one of the most crucial areas that U.S. troops fought to pacify before withdrawing from Iraq two years ago. Elsewhere in the province, local tribal militias claimed they were gaining ground against the al-Qaeda militants who surged into urban areas from their desert strongholds this week after clashes erupted between local residents and the Iraqi security forces. Did U.S. Marines die in vain? It’s an excellent question. The tale is far from over. In 2011, President Obama failed to secure a Status of Forces Agreement with the Iraqi government and, in many ways, attempted to wish away his responsibilities regarding the aftermath of Operation Iraqi Freedom. Likewise, he disengaged from the world stage as Syria spun out of control. The result: tens-of-thousands of Syrian refugees (including foreign fighters linked with al Qaeda) have flooded into Iraq, overloading a government that could barely control its security situation to begin with. George W. Bush – for all his faults – stuck with “the surge” strategy despite enormous political pressure to raise the white flag of surrender. That opened the door for the al-Anbar Awakening and, when he left office, it appeared as though the U.S. had snatched victory from the jaws of defeat. Whether politicians agreed or disagreed with the Iraq War, it is their solemn obligation to ensure that the soldiers who willingly sacrificed themselves for the cause did not do so in vain. If there are no true statesmen left in the U.S. Congress, then Americans should admit it and become like people around the world who are just happy if someone can find them on a map. Fallujah is sometimes called “the city of mosques”; and insurgents made heavy use of them as command posts, arms depots, and defensive positions. Inside the Saad Abi Bin Waqas Mosque in central Fallujah, Marines found small arms, artillery shells, and parts of missile systems. Marines and soldiers engaged insurgents emplaced in mosques, but always with great caution and often using Iraqi troops to finish off assaults. It took Company B, 1/8, fighting on foot, 16 hours of house-to-house combat to capture the Muhammadia Mosque, during which time they were attacked with everything from rocket-propelled grenades to suicide bombers. The people who are in charge of Fallujah now use mosques as armories, staging areas for attacks, and as bunkers when necessary. They plot and plan from inside sacred walls, in part because Western politicians tend to let them do so with impunity. To ignore that this is happening in Iraq, Afghanistan, Pakistan, Syria across the Middle East and in Northern Africa is to invite disaster yet again on American shores. In the Middle East, our adversaries think and act in terms of centuries. In the United States, the vast majority of politicians cannot think beyond the next election cycle. In large swathes of the Middle East, words like ‘honor’ – to the family, to the tribe, and to the nation – are taken seriously. In large swathes of the United States, ‘honor’ is now an antiquated notion, and patriots are portrayed as backwoods hicks by the purveyors of popular culture. In the Middle East, guys who spend years solely focused on memorizing the Koran are in a waiting game with [us]…. These days, Americans are only serious about being unserious – and it will come back to haunt us tenfold. Fallujah is important because it highlights yet another momentous challenge before free nations, while exposing America’s intellectually underprepared and ill-equipped political class. Fallujah is important because it demonstrates that while America’s entertainment-obsessed culture pretends as if it can exist within viral video YouTube bubbles, Xbox fantasy worlds and the studios of late night comics who never found a good man or a higher ideal that they couldn’t tear down, the reality is something starkly different. At one time, vast oceans could be used to make a compelling case that an isolationist America was a safer America. As technology advances, collisions between cultures will speed up. What happens in the Middle East and Northern Africa matters here, and Americans who think that every four years is a good time for a debate on foreign policy are sorely mistaken. When top officials in Washington can make the case that obscure anti-Islam YouTube videos are the cause of terror attacks on U.S. consulates (whether you believe them or not), it’s a clear indicator that the paradigm has changed. Did U.S. Marines die in vain in Fallujah? The answer is up to us. Political leaders and an informed public have a responsibility to make sure that the vision soldiers sacrificed their lives for – a safer world for future Americans – becomes a reality. Posted at DouglasErnstBlog.com on Jan. 5, 2014. Reprinted here with permission on Jan. 9, 2014 for educational purposes only. May not be reproduced on other websites without permission from Doug Ernst.